choir croak out them goodies: A Kook Konk. Ah, Christ - It's just a couple of shows. A Kook Konk. Ah, Christ - It's just a couple of shows. Oh lawdy. 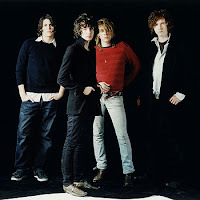 Not-so-guilty pleasure the Kooks are coming back to the states and pulling a PJ Harvey next month, filling small venues with their kooky selves (ha! joke!) and testing out material from their new album, Konk, due April 15 via Astralwerks. I sure do hope they have another go at Loveline. P.S. Aren't they a dreamy bunch of bastards?